On these winter evenings, the dazzling planet Jupiter and the Great Square of Pegasus light up the western sky at nightfall. Be sure to catch them at early evening, because Jupiter and the Great Square start plunging beneath the horizon by around 9 to 10 o’clock this evening. You simply can’t miss Jupiter. It is the fourth brightest body in all the heavens, after the sun, moon and the planet Venus. After sundown, Jupiter reigns supreme in the evening sky by default. The moon and Venus are found only in the morning sky at present. Look to the right or upper right of Jupiter to locate the four moderately bright stars that make up the Great Square of Pegasus. It is difficult to convey the large size of this signpost star formation on the sky chart. These stars lodge far enough apart so that you can place your hand in between any two Great Square stars. Hold your hand at an arm length away. Jupiter and the Great Square will light up the evening sky throughout February. Day by day, however, Jupiter and the Great Square will continue to set a little sooner after sunset. By the time spring arrives in March, they will become lost in the glare of sunset. Tomorrow, we will star-hop from the Great Square to the Andromeda galaxy. 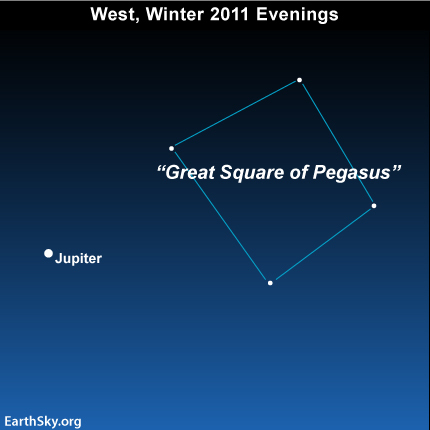 In the meantime, try finding the Great Square of Pegaus to the north (or right) of the blazing planet Jupiter tonight! Site contents copyright © 2019 Recorder Online	except as noted. All rights reserved. | 83 queries in 1.105 seconds.